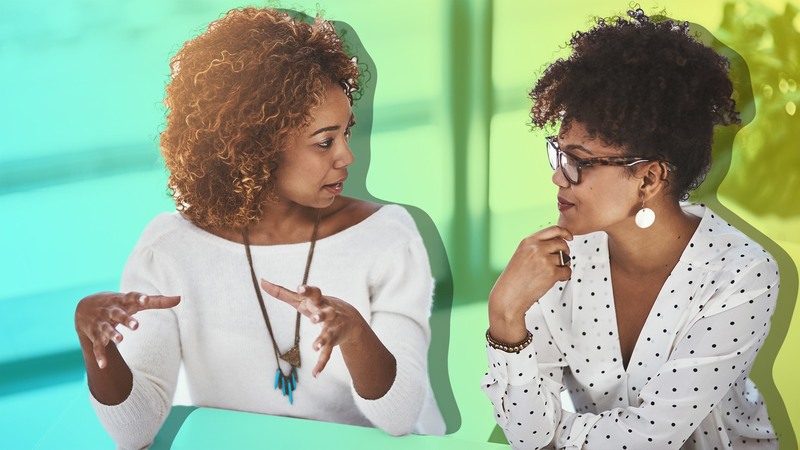 Working at the same company as your best friend or sibling might sound amazing: You get to spend your nine-to-five with someone who’s already close to you. It’s not always that simple, though. You may have days when your sister’s habit of cracking her knuckles is driving you up the wall or friend-group drama means you don’t want to see your friend outside the office, much less inside. There are steps you can take, though, to ensure your relationship with a coworker who’s also a friend or family stays strong. Sit down with your coworker and make a list of the things you won’t talk about while at work, whether in person, through text or over Slack. That way, you’ll keep from distracting each other. For example, maybe you work with your brother, and your father isn’t in very good health. It stresses out both you and your brother, and you realize that if you talk about your dad’s condition at work, you’ll get too worried to focus. You and your brother decide that you’ll only discuss your father outside work unless there’s an emergency. Make sure to also list the positive, funny things that throw you off your groove. I joined a company where one of my college friends worked. We initially distracted each other by talking nonstop about all the podcasts we listened to. Eventually, we decided to cut down on the podcast chatter in order to get more done. It may be tempting to invest all your social energy at work into your friend or family member. After all, you’ve already known that person for a while. However, that mind-set will prevent you from making meaningful friendships in the workplace. During lunch and breaks, make a conscious effort to talk to other people. If you start to develop a rapport with a few coworkers, ask them to get drinks or coffee with you to strengthen that bond. If you run into problems during the workday or get to collaborate on a project, turn to someone other than your friend or family. That way, you’ll still have people you enjoy being around if your pal leaves the office, calls in sick or rubs you the wrong way. Try to diversify your social life outside of work, not just inside it. Say you work at the same office as your best friend — that doesn’t mean your friend should always be your go-to partner for going out, seeing movies or getting brunch, to name a few activities. Part of developing a healthy network of relationships is spending time with multiple people, not only your favorite pal. Let’s say that a museum downtown has a new exhibit that’s getting rave reviews. You’re free this weekend, so you pick up your phone to text your best friend in the next office about going to the exhibit. Stop before you do that, though. As wonderful as your best friend is, you see them all the time. Try reaching out to other friends you don’t get to see as much, or new friends you want to get to know better. After all, one of the perks of a strong friendship is that your best pal will always be there for you. You’ll see them on Monday (and Tuesday and Wednesday). You and your close friend or family member spend a lot of time together if you’re also coworkers. People in close proximity often push each other’s buttons, so try to be patient and remember that your father doesn’t mean to make you grit your teeth when he interrupts you at meetings. Instead, be gentle with him. He’s close to you for a reason. Take time to clear your head and then bring up your problem with him the same way you’d address it with any coworker. Working in the same space as those you love isn’t always easy, but it’s a unique opportunity to make something alongside a person who already understands you deeply. Setting boundaries, being forgiving and remembering to laugh are all key to making a friendship or family relationship rewarding, both in the office and at home.